Katie Souza was a career criminal and violent drug addict—before God transformed her life. Today, she's a healing evangelist, author and host of the television show Healing Your Soul. 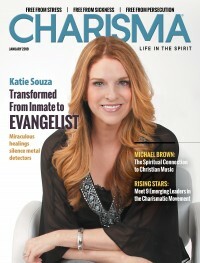 Her Maricopa, Arizona-based organization, Katie Souza Ministries, has helped tens of thousands of prisoners over the last decade to discover the love of God and experience His incredible supernatural power to do miracles. She says her story is proof that true healing can only begin at a soul level—and that same healing is available to everyone. But even true healing can leave scars. "When I look in the mirror, I can still see reminders of my criminal past," Souza says. "One of them is a lump on my shoulder where a broken collarbone failed to heal properly." Souza received the injury after members of a biker gang who owed her money sabotaged her motorcycle, causing her to flip end over end to the pavement. Though police came to help with the crash, Souza fled—after all, she had a large sack of dope on her person, and the bike she'd just crashed was stolen. She left the scene and ran into a shop—and into the hands of the very men who had just tried to kill her. Unable to climb the back fence to escape, she locked herself behind a huge metal door and hid under a desk. From there, she watched as the searchlights from a police chopper flooded the windows, hunting for her. The next day, she escaped—hurt, but not in handcuffs. "Sadly, I would've called that a typical day," Souza says. She says she kept living like that until she was ultimately arrested by federal marshals, who caught her cooking in a meth lab. She was sentenced to over 12 years in prison. But prison did nothing to change her attitude. Her defiant demeanor got her "thrown in the hole" repeatedly by the cops. But God began to get through to her. "Even in my sin, God was still guiding my steps," Souza says. "He made sure there was nothing to read in my unit but a Bible. Driven by the Spirit, I tore through it from cover to cover many times over. Soon I was leading women to the Lord, teaching Bible studies and baptizing people in the showers." Souza had only been in prison for a few years when her parents put in an appeal with the federal court to shorten her sentence. The probability of winning was only one-twentieth of a percent, but they wanted to try. While she waited to hear back, she says the Lord spoke to her and gave her a specific date she would be released. When she announced it to the entire facility, her counselor took her to the psychiatrist in fear she had lost her mind. However, within a year, Souza won her appeal, and the exact release date the Lord gave her became reality. News spread like wildfire throughout the prison. Before long, Katie Souza was on her way home to begin a ministry that would touch tens of thousands worldwide. A decade later, Christian leaders like Kevin Basconi, who leads King of Glory Ministries in Moravian Falls, North Carolina, say Souza is an example of authentic biblical ministry. "The Scripture teaches us in Ephesians 4 that God gives to the church both teachers and prophets for the equipping of the saints for the work of the ministry," Basconi says. "Some of these people are themselves gifts to the body of Christ. Katie Souza is one such gift from God." Souza says her typical days no longer feature drug deals and running from police but instead amazing healings and miracles. Earlier this year, Souza ministered to 150 women at a faith-based prison unit in Florida. She says the miracles were "non-stop from the moment we stepped through the door." One of the women reportedly shot herself in the chest with a .357 Magnum in a desperate attempt to avoid prison. The doctors saved her life and, in the process, wired her ribs and breastbone together with metal wire. Souza asked her if she could still feel the wiring, and the woman nodded, describing it as "chicken wire." When Souza told her the Lord was going to take it out, the woman gave her a skeptical look. Yet an hour later, the Holy Spirit prompted Souza to ask her again if she could still feel the metal wiring. When the woman reached up and touched the area around her eight-inch scar, the wiring was gone. Tears instantly filled her eyes, and all she could say again and again was, "I'm shocked. I can't believe it." Another time, Souza says she saw a bullet dissolve from an inmate's hand—a healing independently confirmed by an officer with a metal detector. On another occasion, a screw vanished from a female inmate's foot, a miracle witnessed by three of her friends who had touched it when it was still there. Souza says she has a model of how she prays for healing: "Whenever I pray for people with metal in their bodies, I always start by asking the Holy Spirit to heal their souls of the trauma they went through that led them to having a metal implant. This includes the surgery and the resulting pain and restricted movement of living with it. Wounds in the soul can prevent creative miracles from manifesting. When the soul gets healed first, the body will follow suit." This approach has led to extraordinary miracles. Souza vividly remembers the healing of an inmate named Larry. Larry had a 32-foot-long, 3,000-pound oil rigging pipe fall on him, which broke his back and neck—and he had the 15-inch laminectomy scar to prove it. Three 10-inch-long metal rods and two metal plates supported his spine. Yet while Souza ministered, all the hardware instantaneously disappeared from his back. "I still treasure the look on the face of the sergeant who tested him with a metal detector," Souza says. "Later, the sergeant told the chaplain he had never seen anything like it in his life, but he sure wished his quadriplegic son was there." After the healing, all the inmates followed Larry to the prison cafeteria. In that facility, everyone had to pass through a metal detector to ensure no one would get shanked or assaulted during meals. That day, for the first time ever, Larry didn't set off the metal detector. Souza says revival then hit the facility, and during the last session, some of the men came up on stage and started dancing: "And men in prison don't do that." "Metal disappearing in our meetings has become the new normal for my ministry," she explains. "In fact, when it doesn't happen, we are shocked." One time, a woman named Jacqulyn had gadolinium toxicity from the metal used in the dye given during an MRI. The patient is supposed to urinate it out, but some people don't, and as a result, the metal adheres to their organs, bones and joints. Jacqulyn described it as feeling like crushed glass cutting her all the time. She suffered this pain for over a year before finally discovering its cause. Unfortunately, gadolinium toxicity is incurable. During a Souza meeting in San Jose, Jacqulyn reported being healed after Souza saw an angel come and extract "every bit of metal from her entire system." Before her healing, even the slightest touch would cause agony. Yet as she testified, Souza says she raked her hands up and down Jacqulyn's arms and feet and Jacqulyn reported no pain at all. Souza says that, as far as she knows, Jacqulyn is the first and only person on the planet who has ever fully recovered from gadolinium toxicity. So how can ordinary believers perform miracles like that? Souza says it all starts with a simple soul-healing message. "When you were born again, your spirit was made instantly perfect, but your soul was not," Souza says. "According to the Bible, your soul can become wounded through things like sin, trauma and even generational issues. These wounds can then control your thoughts, decisions, emotions and every part of your soul." She says that, according to 3 John 2, you will prosper and be in health even as your soul prospers. Because of this, the condition of your inner man can affect every area of your life, from family and friends to businesses, finances, ministry and even your physical health. Souza says this truth is apparent in the ministry of Jesus. "What most of us don't know is that Jesus was doing a lot of soul healing every time He healed physical issues," she says. "Acts 10:38 says, 'God anointed Jesus of Nazareth with the Holy Spirit and with power, who went about doing good and healing all who were oppressed by the devil, for God was with Him.' Jesus worked creative miracles through the Holy Spirit and power, which is translated from the Greek word dunamis. Strong's Concordance interprets dunamis as 'the power to perform a miracle' and 'excellence of soul.'" Patricia King, founder of Patricia King Ministries, says Souza's teaching on soul healing "is grounded in the Word of God and is desperately needed. These revelations are a true light to a desperately wounded and traumatized world." Souza points to Luke 8:43-48, where Jesus healed the woman with a bleeding problem, as an example of healing both the body and soul. Not only was the woman's body sick, but her soul was wounded from 12 years of trauma she suffered from both the physical pain she endured and the social shame she faced. Yet when she touched the hem of Jesus' robe, Scripture says the Lord felt power (dunamis) leave Him, and she was healed (vv. 46-47). Since dunamis means "excellence of soul," that indicates she was healed of the years of trauma that had wounded her, and then she was prospered in her health even as her soul prospered. "Every single believer has wounds in their soul from the daily onslaught of stress, trauma and drama that they face," Souza says. "That's why God has given us all a tankful of Holy Spirit and dunamis power that never runs out (Acts 1:8). The Father knew we would get wounded and therefore need supernatural power to be healed. Right now, you have all the dunamis power you will ever need to take care of every single wound in your soul, no matter where it came from." But Souza says believers will have to put that dunamis to work if they want to see personal breakthrough. "Ephesians 3:20 says God is able to do exceedingly and abundantly above all that we ask or think,according to the power, or dunamis, that works in us," she says. "Extraordinary things will happen when you put the dunamis power in you to work. This is done through your faith to believe you already have it and then your decrees to release it. Spend a few minutes a day asking the Holy Spirit to examine your inner man and release this power so you can become what dunamis means—excellent of soul. Then watch as major shifts happen in every area of your life." Today, Souza's ministry serves more than 3,500 prisons and 500,000 inmates worldwide. Though her focus remains on prison ministry, doors have opened to bring her message of healing to an even wider audience. Her show has produced over 100 episodes since its 2013 debut. 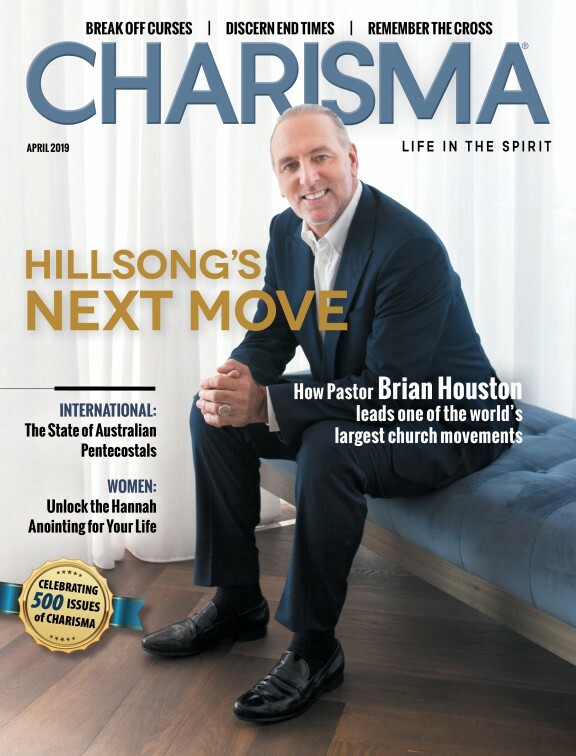 In 2017, she published Healing the Wounded Soul through Charisma House. She's even creating a new television network, called Faith TV, which began airing in 2018 and will expand to DirecTV and Amazon channels this year. "We plan to use the network and our television program to help millions of people in prison and around the world get healed in their soul, so they can see miracles explode into every single area of their lives," she says. Taylor Berglund is the associate editor of Charisma magazine and the host of several podcasts on the Charisma Podcast Network.